M. Pulini, La Madonna col Bambino di Cagnacci. Undipinto per Sant’Arcangelo dall collezione Koelliker, Recanati, 2006. Forlì, Musei di San Domenico, Guido Cagnacci, 2008, no. 46. Little, if anything, can be found in historical records pertaining to Guido Cagnacci’s activity as a portraitist; even the attribution of the only portrait collectively accepted - the Portrait of Emperor Leopold I in the habit of his coronation at Ambras Castle in Austria - was made as late as 1963, at the intervention of Heinz . The recent discovery of the present portrait is, therefore, exceptional. 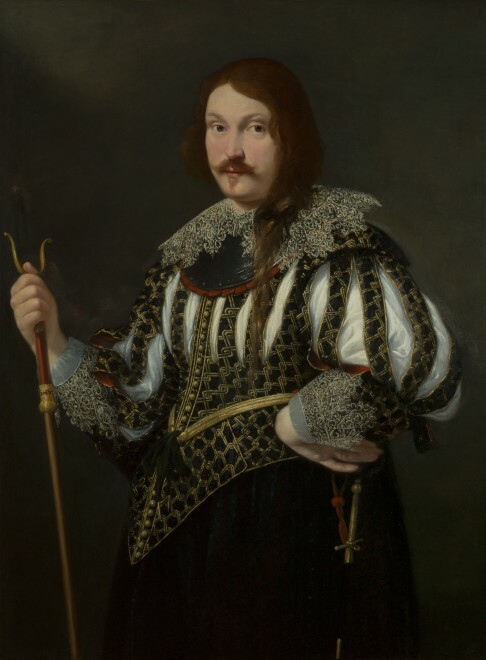 Traditionally attributed to Tiberio Tinelli, Portrait of a soldier was reattributed to the hand of Cagnacci by Daniele Benati and confirmed by Stefano Pierguidi and Massimo Pulini. The work can be dated to about 1640, when Cagnacci was working for the aristocratic families of Bologna, and there are marked similarities with his Cleopatra in the Collezioni Comunali d’Arte, Bologna, as well as with Lucrezia (fig. 1), formerly in the Collection of Cardinal Ruffo in Ferrara and today in a private collection in London (D. Benati and A. Emiliani ed., Guido Cagnacci, exhibition catalogue, Forlì, Musei di San Domenico, 2008, pp. 218-219 and 284-285). Cagnacci’s works from this time demonstrate the influence of Guido Reni, Guercino and Francesco Albani who the artist would have encountered frequently in the Emilian capital. The figures in all three pictures are rendered in a soft, velvety manner, which lends an almost feminine sensuality even to the soldier. Also characteristic of this period is an acute attention to detail, evident here in the meticulously painted gold-trimmed doublet with its ornate and complex pattern of embroidery, or the arquebus rod, which is rendered with the same extraordinary precision as the dagger with which Lucrezia kills herself in the above mentioned picture. Both figures also sport the same woolly, reddish-blonde hair which so many of Cagnacci’s figures are provided with. It has not been possible up until now to verify the identity of the sitter. However, the proficiency and swagger with which the gentleman brandishes the rod of the arquebus suggests that he could have been a captain of the arquebusiers of the papal guard stationed at Bologna. The artwork described above is subject to changes in availability and price without prior notice. Where applicable ARR will be added.